Posted on Tuesday, April 27th, 2010 at 7:45 pm. A look into the past year and a half of a talented singer-songwriter’s passionate journey through life & music. January 25, 2009. Somewhere on the Internet. Sometime in early 2009, I am introduced by email to singer-songwriter Alice Tong through one of our close friends and collaborators, Jason Lee, of TurtlistMedia.com, who at that time was helping to organize the Midwest Intercollegiate Taiwanese American Students Conference at the University of Illinois. Because Jason is a filmmaker who is in tune with rising Asian American artists, when he tells me that Alice is someone I should pay attention to and connect with, I’m inclined to follow up right away. Okay, she could be interesting, I think to myself. I click the play button, and my jaw drops when the audio speakers project a rich robust voice delivering a beautifully written song titled “Try.” There is something about how Alice’s voice resonates and connects with my soul. Only one word comes to my mind to describe what I hear: Amazing. March 21, 2009. Cafe La Flore, San Francisco, CA. In the short time that I have known Alice, I’ve also had the opportunity to post up some information about her music and gigs on TaiwaneseAmerican.org, including an intimate performance at a cafe in the Richmond district of San Francisco. I make it a point to go out and see her play live, but I also drag along TaiwaneseAmerican.org’s creative director and part-time photographer, Anna Wu, as well as a visiting friend, Elliot Kim, who I think will make a great control subject since he hasn’t yet heard of Alice. I want to make sure I’m not completely biased just because Alice is of Taiwanese heritage. Cafe La Flore is crowded. The seats and couches are all taken. Alice has a strong supportive following, I note to myself. No one seems bothered by the fact that it’s standing room only near the barista counter. Even people strolling by the cafe on this lovely evening can’t help but peek in through the large-paned windows to investigate what has attracted this diverse group of Bay area folks. Before Alice performs each song, she tells the audience a little bit about the inspiration for the story and melody. The crowd is seemingly mesmerized, not just with her beautiful voice, but also with, I suspect, a deeper appreciation of her creative-process inspired by everyday experiences. By the end of the evening, Anna and Elliot are new fans, too, and they aren’t alone in this packed house performance. March 27, 2009. Home of Ho Chie Tsai, Berkeley, CA. For the past few years, I’ve been tracking the arts scene and scouring the web and personal contacts for any folks of Taiwanese heritage that I might feature on TaiwaneseAmerican.org. 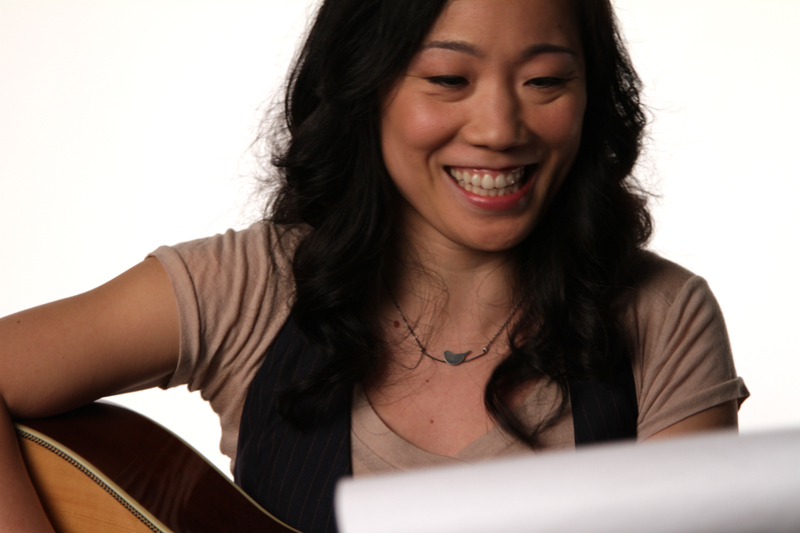 There are only a handful of Taiwanese American female singer-songwriters that are pursuing the craft. The successful singer-songwriter Vienna Teng, lead singers Susan and Emily Hsu of niche DC-based indie band Exit Clov, LA-based solo artist Calista Wu, and Wendy Hsu of YellowBuzz.org and Dzian! are among some of the names that come to mind. But today, I’m lucky to have another talented singer-songwriter Cynthia Lin stop by my place to scope out the location of her live-streaming “Living Room” session, scheduled for the following day. With Cynthia in town all the way from New York, I’m motivated to invite Alice to meet her. 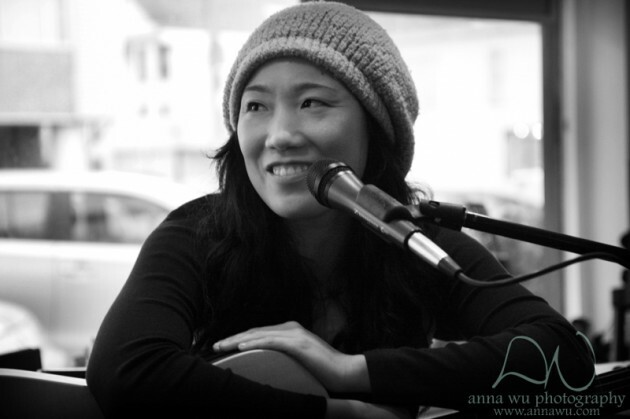 And just as Alice is heading over, luck would have it that another singer-songwriter friend, Alanna Lin, who lives in Los Angeles happens to be in town for an upcoming gig of her own. 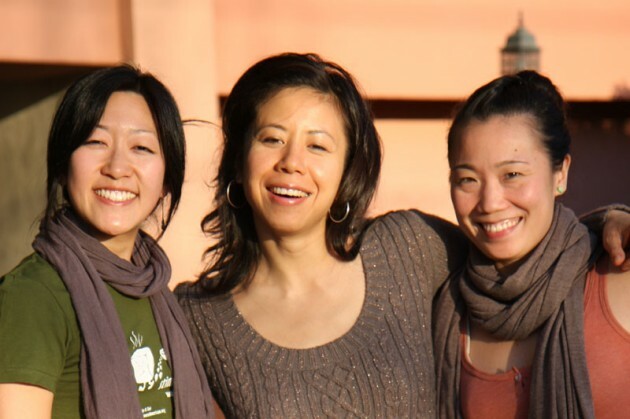 Alanna has recently had her music featured in the FOX TV show, “American Dad,” so I’m excited to bring all three Taiwanese American female singer-songwriters from different major cities together for the first time. What follows is an inspiring afternoon of conversation about music and life, interspersed with moments of fun and hilarity. These three have unique personalities and styles, yet they have such a desire to learn from and connect with each other. There’s no doubt I’m sort of a “fourth wheel,” with no musical talent whatsoever, but I’m so proud that I’ve played a part in bringing these amazing women together. Today, our paths intersect in real life, and I suspect this will happen again many times in the future. May 9, 2010. Union Square Main Stage, San Francisco, CA. 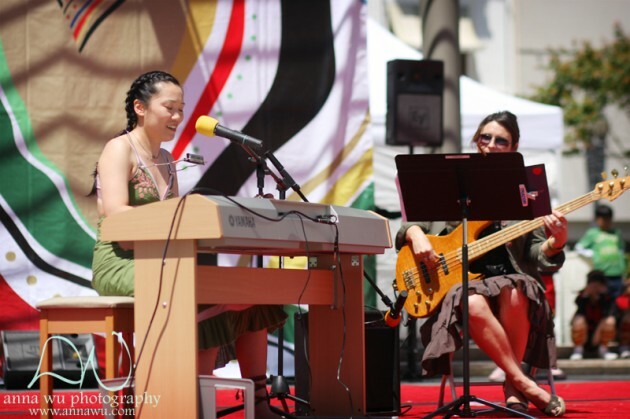 Each year in May, our community celebrates Taiwanese American Heritage Week and Asian Pacific Heritage Month with a grand festival at Union Square in the heart of San Francisco. As one of the organizers, I’m always looking to give some of our shining stars an opportunity to perform on this main stage to thousands of Taiwanese Americans, San Franciscans, and tourists alike. I’m excited to showcase a variety of Taiwanese American 2nd generation performers alongside a Taiwanese dance troupe flown in from Taiwan. This year, I’m pleased to have “discovered” Alice prior to the event, and so I invite her to come perform at this outdoor venue. She immediately accepts, and I feel my list of Taiwanese American performing talent is complete. In fact, it’s a wonderful line up that we will showcase alongside Alice, including two bands, Johnny Hi-Fi and Lion Riding Horses, both fronted by Taiwanese American rockers, Eric Hsu and Young Lee, respectively. We also have other singer-songwriters who command large followings of their own including Carolyn Chen, Jenton Lee, and Diana Li. When Alice begins to perform her set, which includes a Taiwanese melody backed up by cellist Stephanie Lai, there is a noticeable hush from the audience as they tune into her powerful voice accentuated even more by the echoes off the outdoor square’s surrounding buildings. As a musical artist, she predictably does not disappoint. As a Taiwanese American, I know she has found a supportive community and that this is just the beginning of more to come. My friendship with Alice grows through the next months. It’s clear that she has been figuring out a plan for her music career – at one point working on music full-time. A new revamped website AliceTongMusic.com has been launched, and more of her wonderful songs have been added to her MySpace page. Her YouTube site needs some work still, but in time, I know that will happen too. Alice has accumulated quite a significant list of gigs including performances at the acclaimed Hotel Utah in downtown San Francisco and for good causes such as the SF HepB Free and Asianweek Foundation Fundraiser. 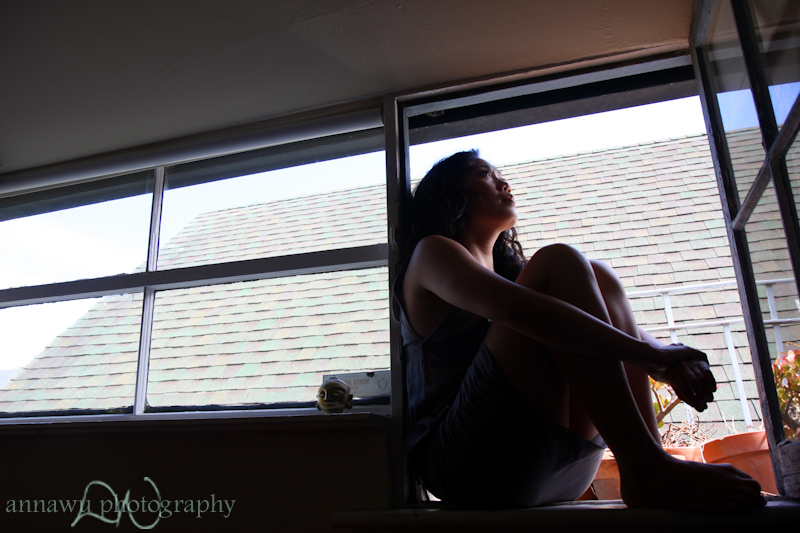 She has traveled to LA’s Japantown for an Asian American showcase known as Tuesday Night Cafe, and she has hosted a spectacular “house” performance at Goldenbridge Lofts in downtown Oakland. Earlier in January, she had sung her rendition of America’s national anthem for Golden State Warriors fans at the Oracle Arena. Slated for the closing banquet performance at the upcoming Intercollegiate Taiwanese American Students Association West Coast Conference at USC, there is no doubt that Alice is one busy lady. But fortunately for us and our partners in the community, Slideshow Pictures and talented director Karen Lin, we’re able to recruit Alice to take part in our Census 2010 PSA video production promoting the “Write in Taiwanese” campaign. Our team has big plans for a wide TV and online broadcast of a quality video educating our community about their right to identify themselves as Taiwanese on the Census form, so they are selective about who to showcase. It needs to be win-win for all involved. Alice is flown down to LA where she and her family members are filmed in front of a white screen. It’s an efficient production, as folks come in and out at scheduled times throughout the day. Many of the other participants in the PSA are prominent and recognizable faces in the Taiwanese American community – actors, singers, community leaders. Alice may not realize it, but we’ve selected her for good reason; We know she’s on her way to a successful musical career, and it’s in our best interest to grab her before she’s out of our reach. 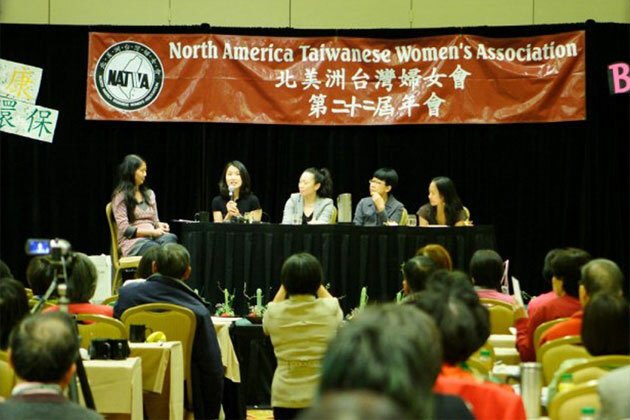 Months later, Alice is sitting on panel with four other Taiwanese American women speaking to over 200 first generation mothers at the North American Taiwanese Womens’ Association Conference taking place in Toronto, Canada. The topic is “healthy living,” something that Alice is an excellent role model for. She reflects on her educational path and motivation for becoming a licensed clinical social worker, and how music has always played an important part of her life. Judging from the chuckles in the audience, the mothers are clearly enjoying her stories about how life, work, and music intersect. At one point she tells the moms how they remind her of her own, and then mentions how grateful she is to her parents for allowing her the opportunity to explore her passion in music and the arts. Although they worried about her choices, as all parents do, it was that opportunity, which allowed her to be where she is today. Though Alice’s own mother isn’t present to hear those words, the glowing smiles and focused attention from these newly adopted mothers in the audience signal a warm reciprocal embrace for Alice, her talent, and her passions. April 24, 2010. The Fire-pits, Ocean Beach, CA. 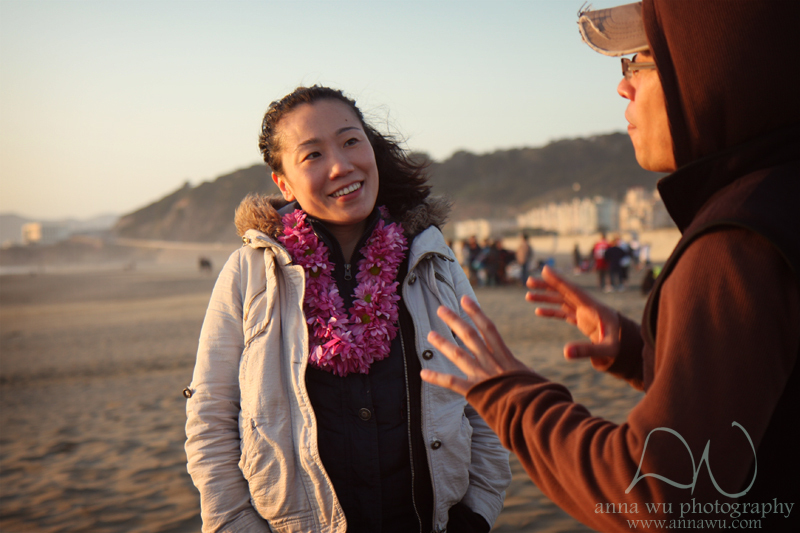 TaiwaneseAmerican.org’s creative director Anna Wu and I are invited to Alice’s birthday celebration at Ocean Beach. It’s a beautiful brisk evening as the sun starts to set on the clear blue ocean horizon. A blazing wood fire crackles in our metallic fire-pit as her close friends huddle around the glowing warmth. These friends and some of her band mates are here to share this big day with her, and we feel privileged to be here too. It seems this journey during the past year and a half has marked just the beginning of more to come. Indeed, it’s a special birthday, because she shares it with another birth — that of her upcoming CD titled “please be brave before the lions they come.” We’re not exactly sure what that means yet, but we do know the voice that comes with the songs will be completely worth it. With two birthdays to celebrate, we come bearing a present. It’s not much in our eyes, but we think it may mean a lot to her; TaiwaneseAmerican.org has decided to become an official media and financial sponsor of an upcoming tour and CD release party that she has been planning. After all, every time she begins to sing, we are captivated all over again. She’s going places, and we want to be there right behind her, supporting her all the way. Progress takes participation, and we hope that you might show Alice some love, too, by supporting her as well.